Paragon saves utilities $500,000/site with Woodward governor reverse engineered solution. Paragon has long-standing relationships with many utilities built over years of providing them with hard-to-find components, outage support, and general sourcing solutions. One such utility approached us to find a source for existing Woodward governor parts. The plant site was a two-unit site with only one unit operating, and over the years, the operating plant had salvaged parts from the other unit. When the plant decided to restart the second unit, it was discovered that several of the Woodward governor parts on the Terry turbine were obsolete. These governors are used to control the speed of a turbine. 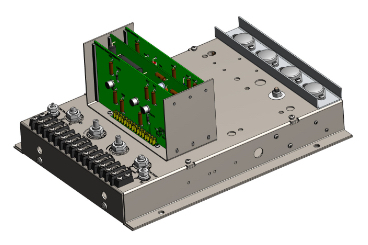 3D model generated for the enclosure manufacturing. The Overspeed Monitor was reverse engineered to complete the control system. The utility wanted to use identical controls within the two plants, however the OEM developed a digital controller and discontinued support of the installed equipment. Discovering there was a depletion of available parts in the surplus market, our Instrumentation & Controls Lab (I&C) pursued reverse engineering of the critical Woodward parts. In order to begin this process, previously used and qualified Woodward parts were obtained from the utility and from our expansive warehouse to use as specimens for the reverse engineering and replication process. We chose to reverse engineer and replicate the original controls to support the customer. The reverse engineering process involves redrawing a system schematic by tracing every electrical connection of the sample, identifying all of the discrete components, generating Gerber files to manufacture circuit boards, measuring mechanical components, composing manufacturing drawings, analysis of electrical and mechanical components, procuring necessary parts, assembling, and testing. At the conclusion of testing a successful prototype, engineering equivalency reports and dedication plans are generated and submitted to the customer for their approval. 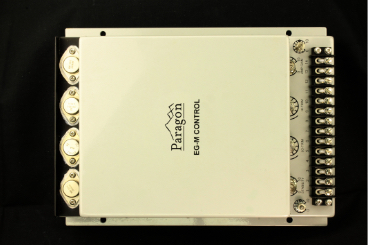 Although this is a single example of the many configurations of this EGM box, Paragon’s I&C Lab has repaired many of these controls in addition to converting one configuration to another. Another component that comprises the governor control system is the ramp generator and signal converter. The replicated version performs identically to the original version. The customer also needed a manual speed controller, but unfortunately, a sample could not be located for reverse engineering. Instead, our I&C Lab used customer photos and OEM drawings to manufacture and qualify (both electrically and seismically) a controller to fit the application. An overspeed monitor was the final component necessary to complete the control system. The unit was obsolete and was reverse engineered using a sample from our warehouse. 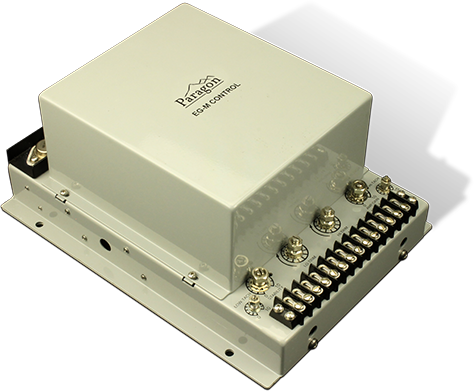 The OEM enclosure was originally cast out of aluminum and we determined it was more economical to manufacture the enclosure out of aluminum block. We generated a manufacturing drawing and had the enclosure manufactured to within 5% of the weight of the original enclosure. In addition to solving the utility’s obsolescence issue, we have the ability to supply new reverse engineered Woodward governor components for other nuclear and non-nuclear utilities around the world. The Woodward governor components are a small example of the reverse engineered and manufactured products our I&C Lab is capable of producing. Several utilities have addressed the obsolete part issues for the Woodward governor system by modifying their entire governor control system with an OEM digital upgrade. However, these modifications may take years to implement. We can support the original analog control system until such upgrades are improved and installed. This is just another example of the innovative solutions offered to our customers to maintain the safe operations of the nuclear plant fleets worldwide. The part numbers below have been reverse engineered by Paragon and are available for manufacture. Click on each part number to link to the Paragon Catalog. Copyright © 2019 Paragon Energy Solutions.